TEMPORARILY OUT OF STOCK.....You will never go back to the brown lunch bag after carrying this eye catching quatrefoil aqua and white pattern lunch tote. Thermal lined with easy clean exterior, hand carry handle, three sided zipper closure and open pockets on both sides of tote. 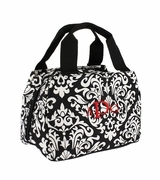 Can be personalized with name or monogram. 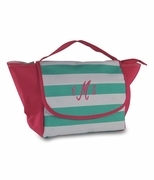 Quatrefoil lunch tote measures 10.5W" x 7"H and six inch wide bottom. 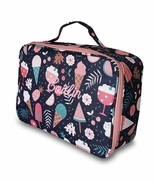 Purchased this insulated lunch bag for six girls in our office that decided to eat healthy and start bringing our lunch to work. We used these personalized bags as a motivation point to eat better and it worked. We started strong and got better each week. This was a gift for my granddaughter. She absolutely loved it! !